Do you have a Cuckoo clock that needs work to bring it back into full operation again? This is what I do in my shop. I work on Cuckoo clocks and get my greatest sense of satisfaction after bringing them back into full operation. Musical Cuckoo Clocks are my speciality. I handle One and Eight day Cuckoo clocks and One and Eight day Musical Cuckoo clocks. I clean and lubricate the clocks Movements and Music boxes and I can fix or replace the necessary parts and make the needed adjustments. Then I thoroughly test the Cuckoo clocks to assure their operational standards. I take apart all of my Cuckoo clocks and clean the movements and chains in my ultrasonic cleaner. After that I oil all the needed movement locations. Then I test the movements to be sure they are in full working condition and make any repairs if necessary. And finally if needed I install new bellow tops. Prices vary depending on needed repairs. If you can send me pictures of the Cuckoo clock inside and outside and give me a general description of the clocks condition this can help me determine the repairs needed and then I can give you an estimate of the cost for repair or restoration. If you would like my service at that time I will explain the best methods for shipping the Cuckoo Clock clock to me. This includes keeping the weights so that they do not damage the Cuckoo Clock during shipment. Send me a message describing what is happening with your Cuckoo Clock. I will let you know what can be done to repair your Cuckoo Clock. 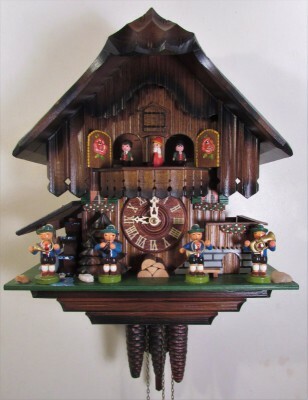 Click the button below to send me pictures of the Cuckoo clock inside and outside and give me a general description of the clocks condition this can help me determine the repairs needed and then I can give you an estimate of the cost for repair or restoration.